Decorate for Halloween with plants! 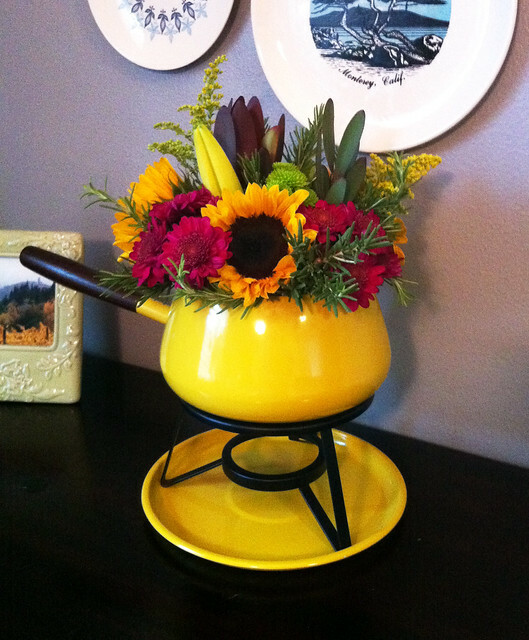 Here's a cute idea for your fall flower arrangements: use your retro fondue pot! I bought a mixed bunch of flowers at the grocery store and arranged them in my groovy yellow pot. I made a tape grid over the opening of the pot, arrange the largest flowers (sunflowers and stargazers) in the grid openings, trimming as needed to create a mound shape. Then I filled in the extra space with the rest of the flowers and fillers. It came out really cute and was a great reason to dust off the fondue pot.